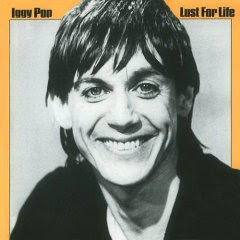 So if Iggy made a big change from his Stooges days with The Idiot, he seems to be balancing the shift with this album. This is definitely half-way between the Bowieness of The Idiot and the raw power of Raw Power. This makes this a very Bowie influenced album but very recognizably an Iggy Pop album. You get more the sense of Bowie helping as opposed to masterminding this. This makes Lust For Life an even better album than The Idiot, each single track is great showing a new focus from Iggy, which is kind of represented by the picture on the cover of the album. The kid is clean, but he is definitely the same old devil. The songs here are harder and catchier than in The Idiot and probably than any other Iggy album, just the title track and The Passenger are definitely worth the price of admission and everything else is high quality topping in a great cake. If you like Iggy this is the essential album for you to get, and you definitely will not regret it. Now we say goodbye to Iggy Pop (and Bowie which is here as a producer) for ever. I get teary eyed. David Bowie, Iggy Pop and engineer Colin Thurston produced the album under the pseudonym "Bewlay Bros." (name via the final track on Bowie’s Hunky Dory). Recording took place at Hansa Studios in Berlin and featured Ricky Gardiner and Carlos Alomar on guitars with Hunt and Tony Sales on drums and bass, respectively. Trivia buffs have noted that, with Bowie’s presence on keyboards and backing vocals, the band included three-quarters of the future Tin Machine line-up, missing only Reeves Gabrels; in fact it was the Sales brothers’ hard-rocking contribution to this album that led Bowie to invite them to join Tin Machine twelve years later ("Check out Lust For Life," Bowie told Gabrels, "I’ve found the rhythm section! ").